The Reality Diet was developed by Dr. Steven Schnur, founder of the largest cardiology practice in south Florida. Schnur designed this diet as a long-term approach to healthy weight loss, so on this eating plan you won’t be eliminating any food groups or counting calories, as is the case with many popular fad diets. Instead you simply eat satisfying portions of a diverse array of wholesome foods with an emphasis on maintaining a high intake of fiber. When your diet is based on foods that naturally contain fiber you will experience a diminished appetite, which supports weight loss and simultaneously reduces your risk of heart disease and cancer. The first section of the book is called “Facts About Food And Your Body” and includes subjects like dieting myths, good and bad carbs, the pros and cons of protein, and information about dietary fats. Dr. Steven Schnur explains one of the key concepts of the diet plan, which involves choosing nutritious sources of carbohydrates that contain the right amount of fiber. In part two, “The Reality Diet”, he outlines the practical aspects of the diet such as preparing your kitchen and goal setting. On this eating plan you will eat a designated number of servings, depending on your unique needs, from seven categories of healthy food. The recommended foods are high in nutrients, healthy fats and fiber, which stops you from feeling hungry and maintains your energy levels. You will eat three main meals daily but snacks are not included because Dr. Steven Schnur believes that snacking is a habit that trains your body to expect food every couple of hours and can easily increase your intake of calories. He says it is better to eat complete satisfying high-fiber meals three times a day, with the exception of people with diabetes who may need to eat more frequently. Every day you succeed with the nutrition plan and do some exercise you can reward yourself with a healthy dessert. If you stick with his guidelines you should be able to lose 7 to 8 pounds a month, which is a sustainable and healthy rate of weight loss. Part three of The Reality Diet, “Living with Reality”, deals with the importance of exercise and offers tips for maintaining your healthy eating plan in restaurants, on holidays, and advice on keeping the weight off for good. The final section includes an eight-week meal plan with recipes and food lists. Fruit, vegetables, oatmeal, granola, whole wheat bread, rice, pasta, chicken breast, seafood, wild game, turkey bacon, fat-free cheese, skim milk, egg whites, beans, tofu, cashews, walnuts, peanut butter, low fat potato chips, canola oil, non-fat mayo, sugar substitute, dark chocolate, tea. Schnur asserts that exercise should not be regarded just for correcting dieting mistakes, but is an important component of any healthy diet. It helps to burn calories and build muscle, which boosts your metabolism. Regular physical activity also protects you against cardiovascular disease and a range of other conditions. Ideally you should burn 2000 calories a week, which can involve several intense exercise sessions or can be spread out into many shorter bursts. 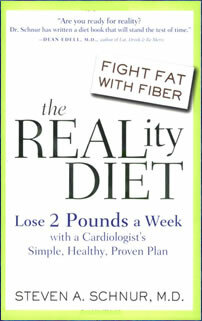 The Reality Diet: Lose the Pounds for Good with a Cardiologist’s Simple, Healthy, Proven Plan retails at $15.95. Encourages the intake of a wide variety of fresh, unprocessed foods. A high fiber diet can reduce appetite and decrease the risk of cardiovascular disease, diabetes and cancer. Recommends a realistic and healthy rate of weight loss. The Reality Diet Contains a structured eight-week meal plan with recipes. Encourages keeping a journal of food, exercise and emotions, which has been associated with a greater chance of successful weight loss. Program was developed by Dr. Steven Schnur a cardiologist. Requires counting food groups, unless you strictly follow the meal plan. Encourages the intake of margarine and sugar-substitutes. No particularly new or unique information is provided. Some of the recipes can be time consuming to prepare. The Reality Diet was developed by Dr. Steven Schnur as a healthy lifestyle approach to weight loss. It includes an eight-week meal plan with recipes that emphasize fresh and unprocessed high-fiber foods.